They held the 49th annual Polk County, TN 'Ramp Tramp' this weekend. Our first time at this down-home gathering, but it won't be the last. The site is a 4-H camp originally built by the CCC. Inside, folks enjoying local music and the ramp dinner. Outside, vendors sell local products: here they are steeping sassafras tea. Beans, corn muffins, potatoes, bacon, and eggs with ramps. Buttermilk pie and coffee. Yum. The band? Ducktown Station. They got lots of folks up and clogging. The Cosby Ramp Festival, at the other end of the Smokies in Tennessee, is next weekend. The one in Cosby is just a bit older than the 49-year-old Polk fest; it was started in 1954. What are ramps? According to this description, they are a wild member of the onion family that grows from Nova Scotia south. That explains why I think the 'wild leeks' that a neighbor searched for every spring in our creekbed in upstate NY were the same thing. They probably were. 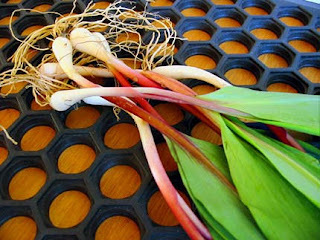 Here's a lot more on using ramps or wild leeks. Thanks to Lisa Jacobi for the ramp photo. (Update:) More photos from the Ramp Tramp are in a slide show on Ducktown Station's website, via Lisa Jacobi. But if you're on dialup like me, be warned it will take awhile to load. When I first came to Western North Carolina in the mid-1970s, I was suprised at how developed it was. I had expected large stretches of wilderness but found that every mountain cove had homes in it. Despite that, in Black Mountain, where I lived then, and in other areas, you could ride a few miles out of town and find nothing but old farms and a few small cabins, and feel free of civilization for awhile. No more. The area around Black Mountain is filled with large new developments, in areas I'd never have expected to see fancy homes going in. Now that I live several counties west, where development was rare when we first started visiting here, we are shocked to see large tracts of land being cut and roads going in for multi-lot developments. We wonder how the roads will be able to handle the number of people who could live here in the future, if houses go up on all those lots. Environment North Carolina has released a new report that says thousands of acres of forests and farmlands in NC are being lost to development every year; two million acres in the last 20 years and they expect over two million acres more by 2027. In Western NC, according to this Asheville Citizen-Times story about the report, developed land has increased 44 per cent in the last two decades and will increase by another 22 percent in the next 20 years. We all need wilderness to feed our souls. In the future, will our children only be able to find it in managed parks? Note also, Environment North Carolina's photo gallery on Flickr, lots of photos contributed by the photographers. Lovely, and a reminder of what could be lost. (Updated:) The Asheville Citizen-Times reported on the damage to North Carolina's wine crop from this month's freeze. These Georgia vineyards suffered similar damage, but they say they'll get some wine this year. Oh, wait, what's that alien-looking UFO in the photo? Must have been that pesky wasp hanging around an umbrella. Check out the lovely photos from the Hiwassee River posted by R. Neal on Knox Views last night. That's the Bear on the Square festival in Dahlonega, Georgia. A few photos from today for now, more to come. Lots of folks on this lovely square. Lots of people playing music, too, and others just enjoying. Debbie's jewelry stand: do you see me? Walter Bahn working on a bowl. A Day in the Life of Asheville is a project in which local photographers post photos, all taken on one day. They're all being posted in Flickr, and were taken on Friday. The all-day wet snow yesterday doesn't seem to have caused any more damage, although it will take many of the trees and shrubs awhile to recover. These geese, on Cherokee Lake, made it OK.
How bad was it? Facing South has compiled links to reports of crop damage around the South. Looks like we won't be making any trips to apple orchards this fall, unless they can bring in apples from upstate New York or Michigan....but oh, no, not the blueberries, too! (Update:) Susan, from Georgia's apple capital Gilmer County, reminds us that this was Dogwood Winter. We could still have Blackberry Winter, down the road. Still too depressing around here for photos of the wrecked foliage after the freeze. For some good photos of the weekend snow around Asheville area, where it was pretty heavy, photo gallery from the Citizen-Times. The C-T also reports today that the Western NC apple crop has been pretty much wiped out, maybe as bad as the 1955 freeze. And, of course, the report about Monday morning's plane crash at Murphy-Andrews Airport, which severely injured the pilot, a surgeon at the local hospital, and killed two. Reports in the comments on the story suggest another doctor was one of the victims (although the comments I read earlier seem to be gone from the site). Sad day in Cherokee County. Nothing new here as looking at all the frozen flowers does not inspire photo-taking. Saddest are the brown frazzled dogwood flowers. I had several good dogwood-filled sites I wanted to photograph this weekend. But 4 days in a row of freezing nights has waylaid those plans. For some nice Smokies scenery, though (taken mostly before the freeze), see the Knoxville News' All Smokies blog. Photos here from Fletch, Al Smith, and others. But there was lots more in the higher mountains east of us. Most of the plants that had leaves got pretty well frozen (tried to cover them but the wind just blew the coverings away); even colder tomorrow morning.